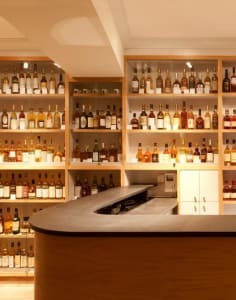 Soho Whisky Club is a private members' speakeasy whisky bar, tucked away above The Vintage House whisky shop in the heart of London's famous Soho. Aside from being a private members' club, the Club also runs tutored whisky tastings. The tutored tastings come in an array of formats, focusing on types (e.g. Scotch, Bourbon, Rye, pot still), nationalities (e.g. American, Irish, Scottish, Japanese, Indian) or flavour profiles. The most popular tasting format is 'A Crash Course in Single Malt Scotch', with a lineup of six single malts and a tasting host to chaperone the attendees through the myriad of styles, flavours, history and ages. For the fledgling novice and seasoned connoisseur alike, there's always something new to learn about whisky.